Kataru's love and pursuit of Farming: Trellis system for candycots (fancy apricots)! In the early stages of installation. Unfortunately, their machine broke down and they will be gone until next week some time. 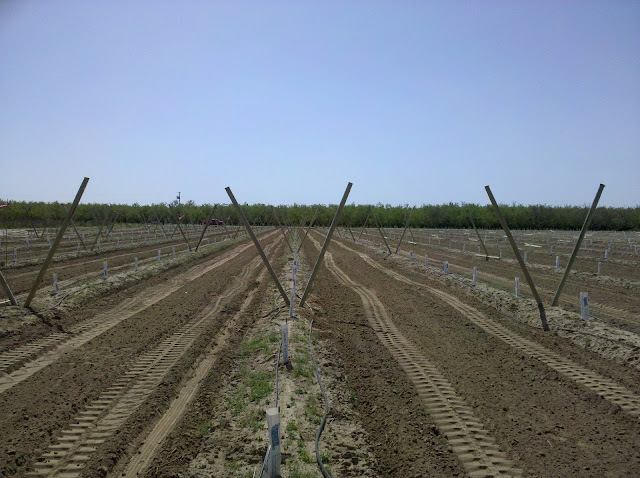 Trellising is used for canopy management so the interior parts of the tree will get plenty of sun and fruit abundantly. Kinda spreads out foliage to facilitate photosynthesis. Otherwise, excessive shading may lead to lower yields. Plus, trellis system also makes it easy to prune, spray and harvest.